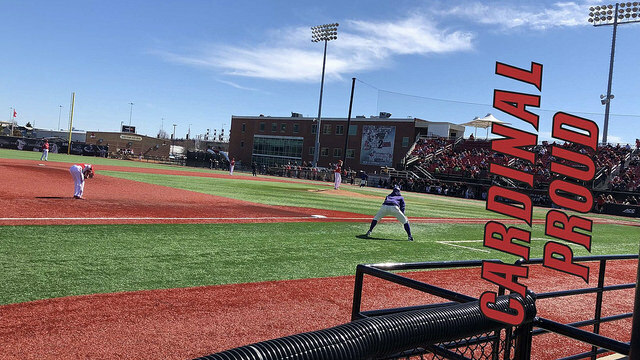 Jim Patterson Stadium-Louisville, KY: It’s that time of year again, when college baseball fans can rejoice because baseball for us starts so much sooner than the pros. 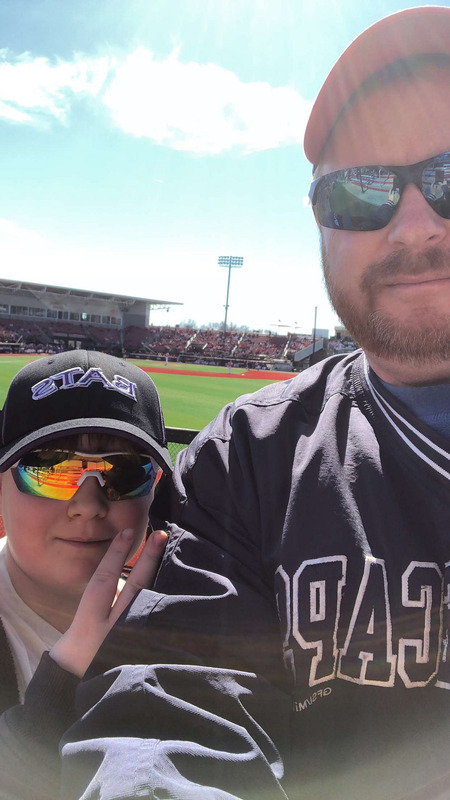 This can make for some rough game weather wise in February and March, but for us we had a perfect day in the ‘Ville for our first game of the season. 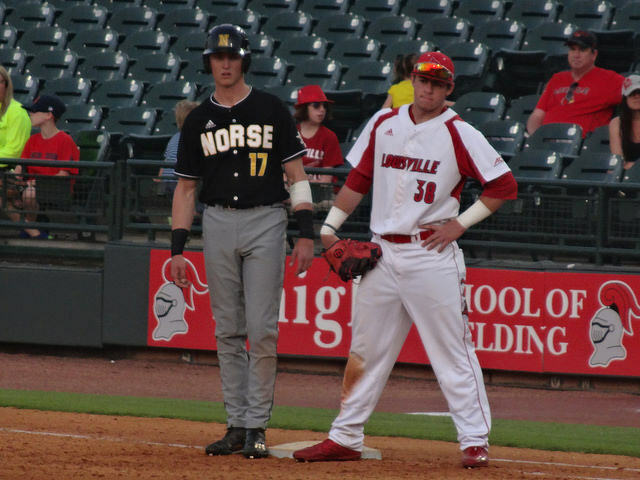 The Cards were hosting the Western Carolina Catamounts for a non-conference series, and were looking to stay undefeated. 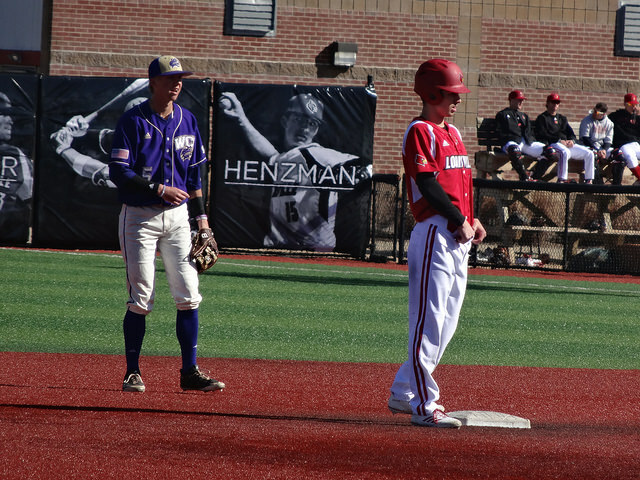 Leading the charge offensively for Louisville was second baseman Devin Mann, who went 1-3 with an RBI and a run, and Danny Oriente who also went 1-3 with an RBI. 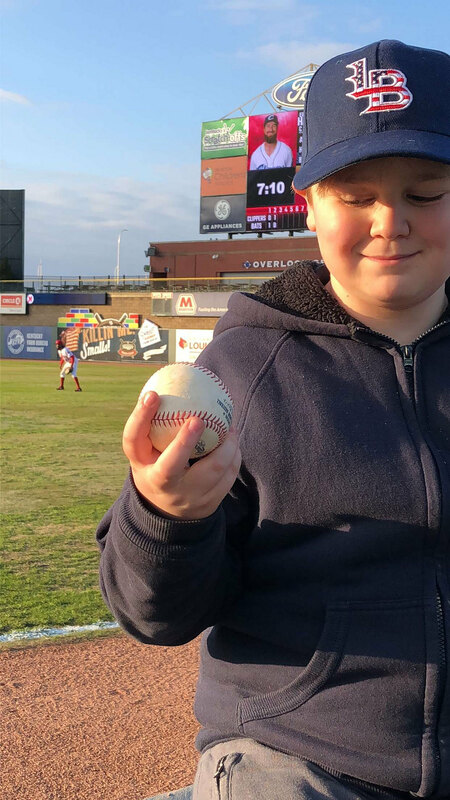 On the mound, Liam Jenkins started the game, throwing three innings while giving up one run on one hit, and striking out six. 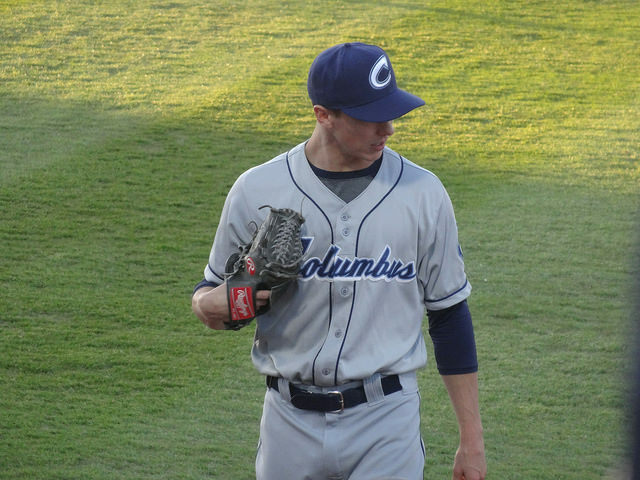 Reid Detmers earned the win in relief, throwing three scoreless innings and striking out seven. 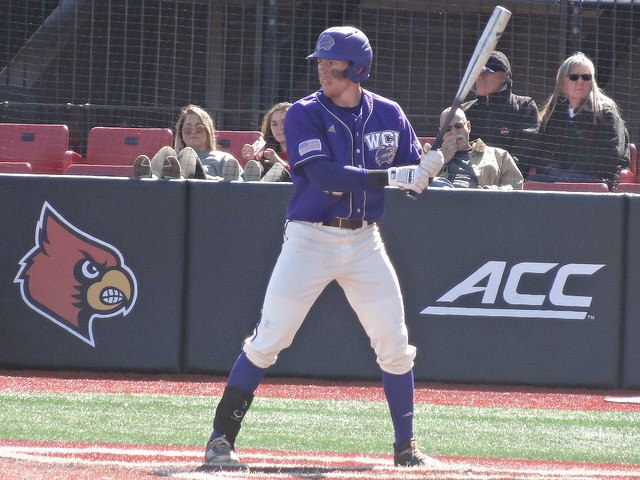 Final: Cardinals 3, Catamounts 2. The weather has turned cold and nasty again, so we haven’t been to any more games. 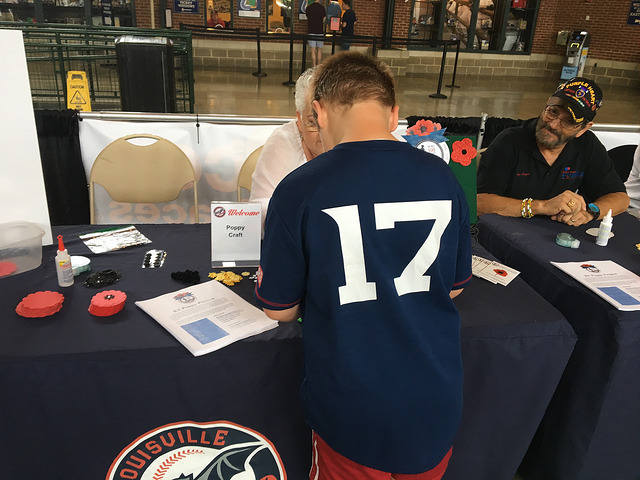 We have lots to look forward to this summer, though, and Brian has already started his Little League practices, so more to come. 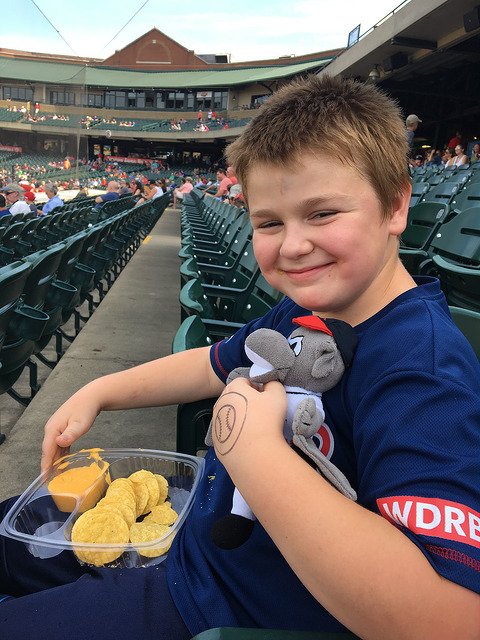 Nachos and cheese for that cheesy grin! 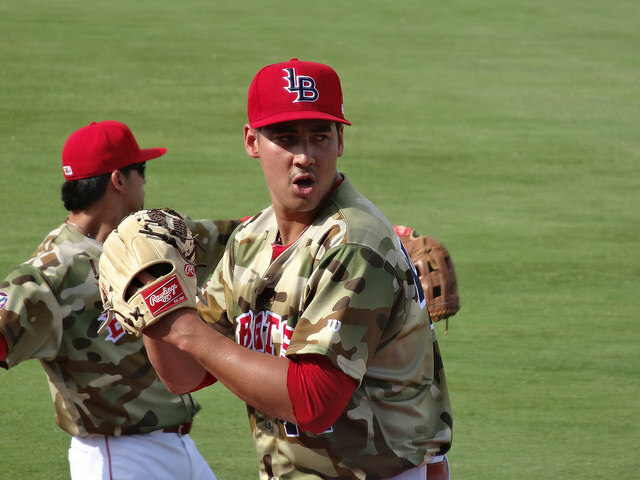 It was another beautiful night, as Robert Stephenson took the mound for the Bats. 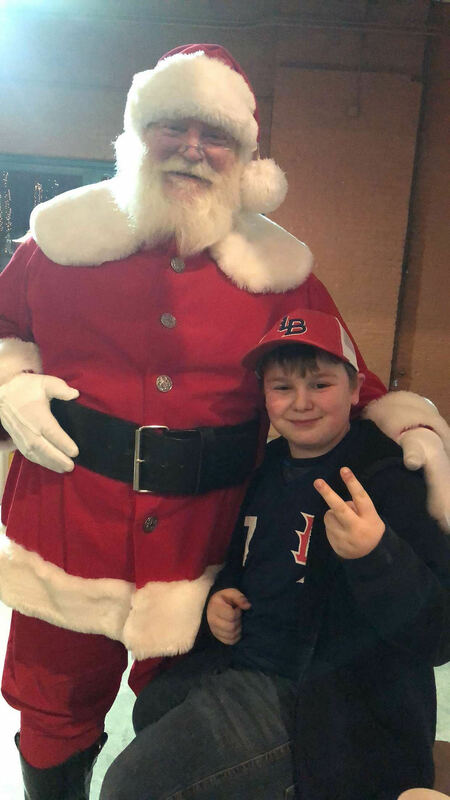 He threw a perfect four innings, giving up no hits or runs. 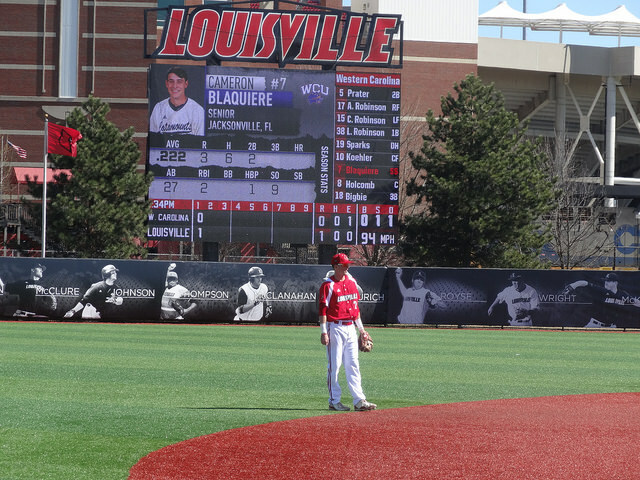 The Louisville offense came alive in the fifth inning, however, starting out with a Brandon Dixon solo home run. 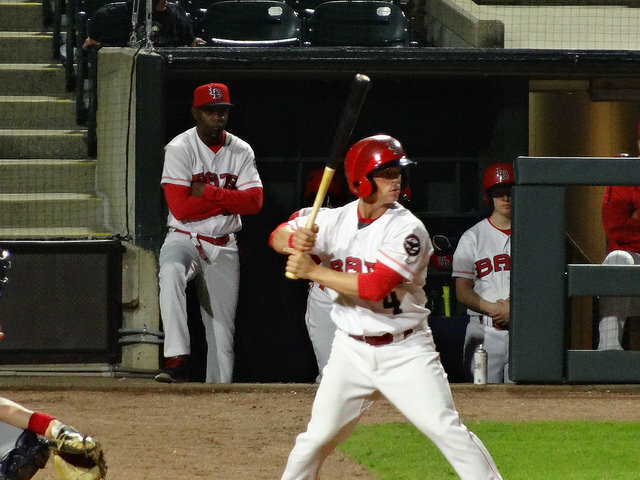 Hernan Iribarren would later smack a two-run single, extending his team’s lead to 3-0. 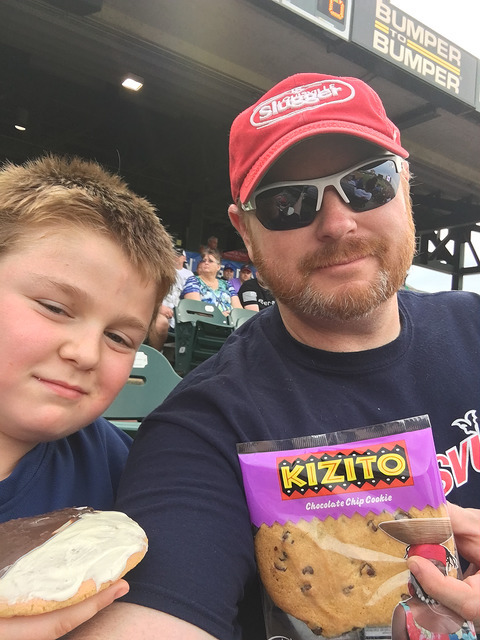 Brian and I needed a little snack during the game, again, and this time went with some Kizito cookies. 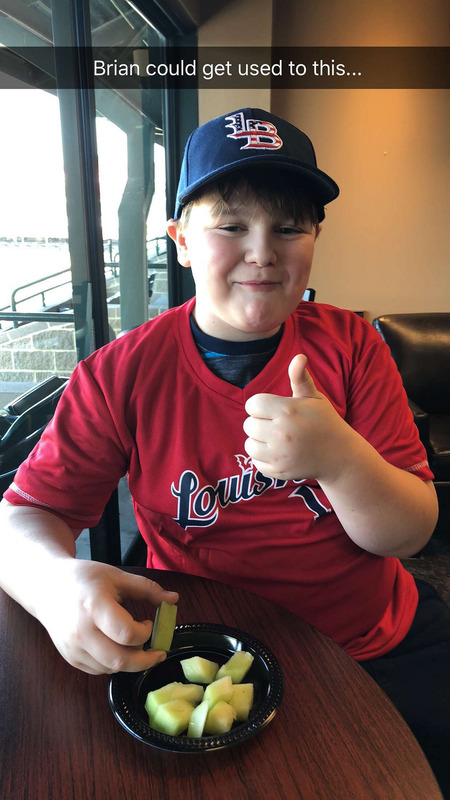 The cookie lady walks around the ballpark with a basket of cookies on her head, and it’s hard to say no! The cookies are really good and priced right, also, which helps to feed hungry kids. 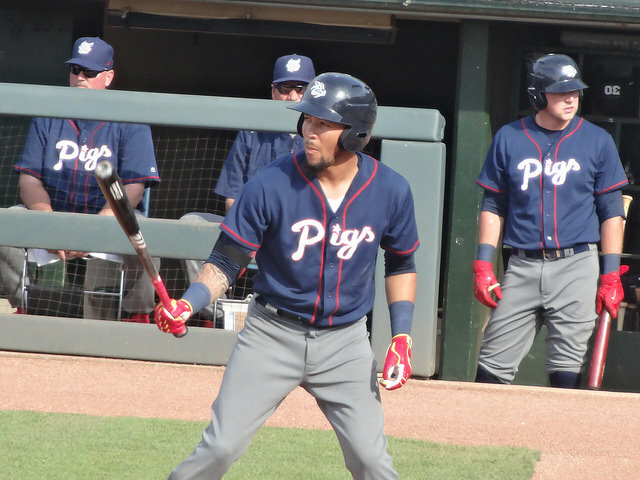 The wheels fell of a bit for the Bats in the eight inning, though, as the Iron Pigs tapped relief pitcher Kyle McMyne for four runs on four hits to take the lead. 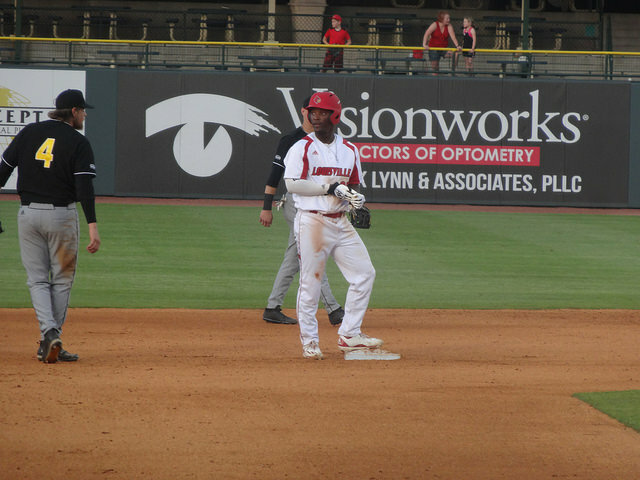 Louisville tied the game at the bottom of the inning, after Phillip Ervin’s base hit that scored Stuart Turner. With the game tied 4-4 in the bottom of the ninth, Sebastian Elizade hit an infield single to bring home Zach Vincej for the walk-off win! 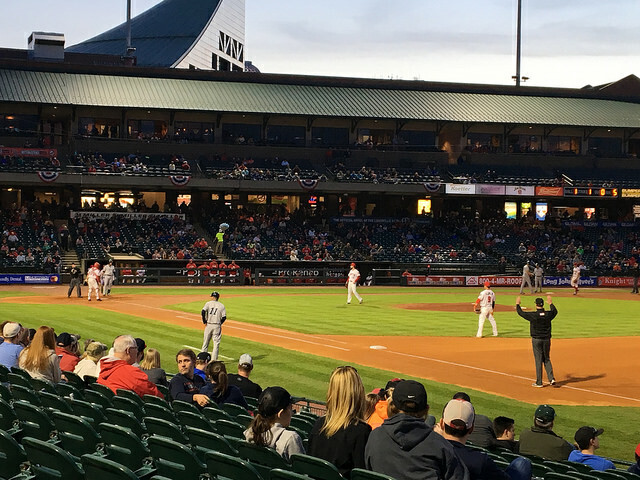 FINAL: Bats 5, Iron Pigs 4. 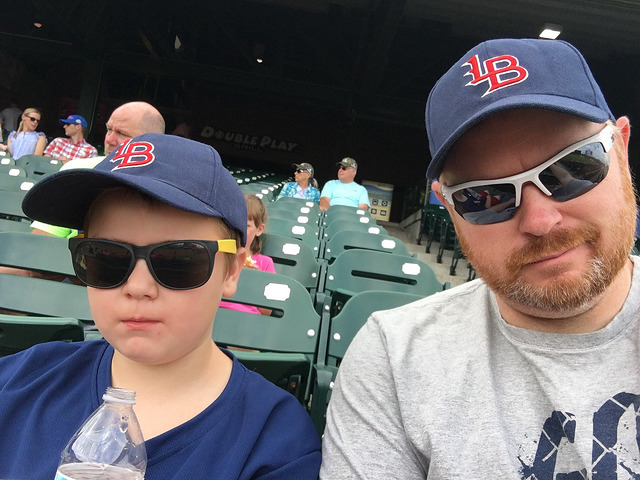 Louisville Slugger Field-Louisville, KY: I didn’t like this game. Not at all. 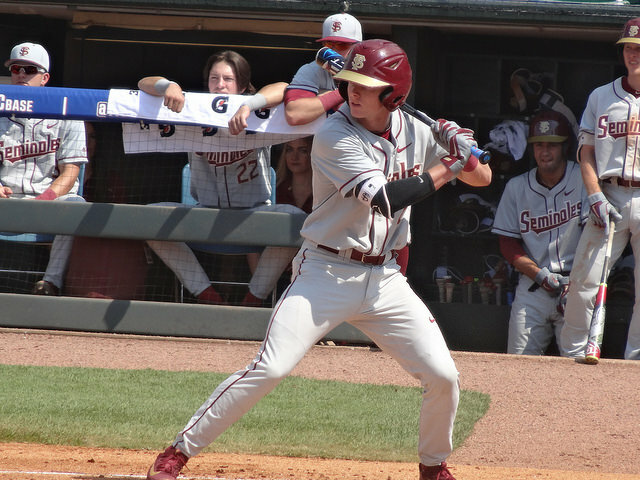 In some way of dark magic, Florida State’s season came alive the weekend before when they rode into town and spanked the Cardinals two games in a row on their home field. One would think that this game would be different, that Louisville would be pumped up and out for revenge. 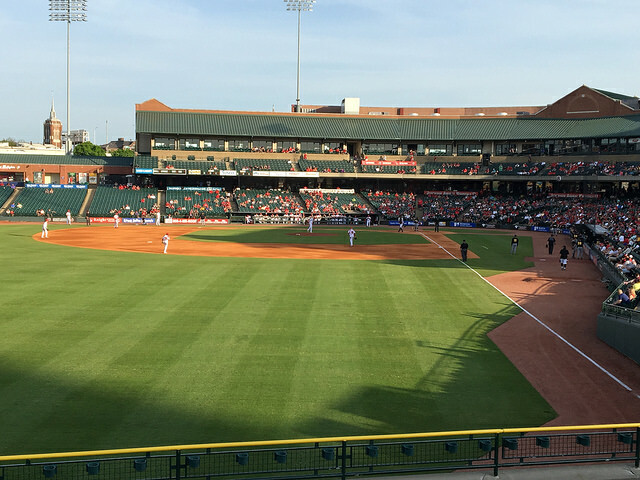 Unfortunately for the packed house clothed in red and white here in the stands at Slugger field, the opposite happened. 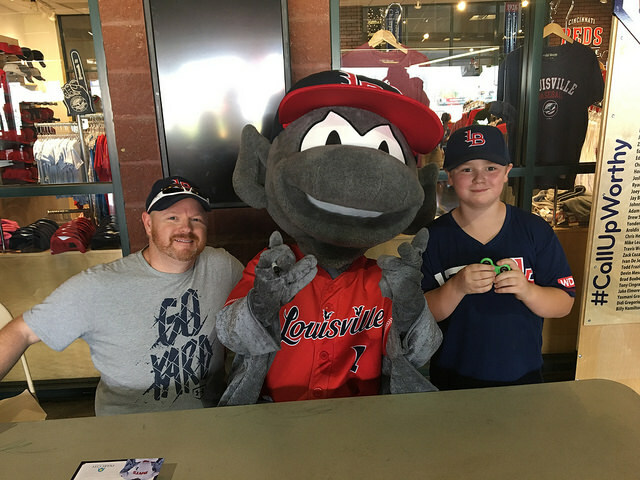 The Cards seemed to play some uninspired baseball, en route to eliminating themselves from the tournament. From here forward, I’ve decided not to mention any Seminole player by named during the re-caps. Sorry, it’s nothing personal. 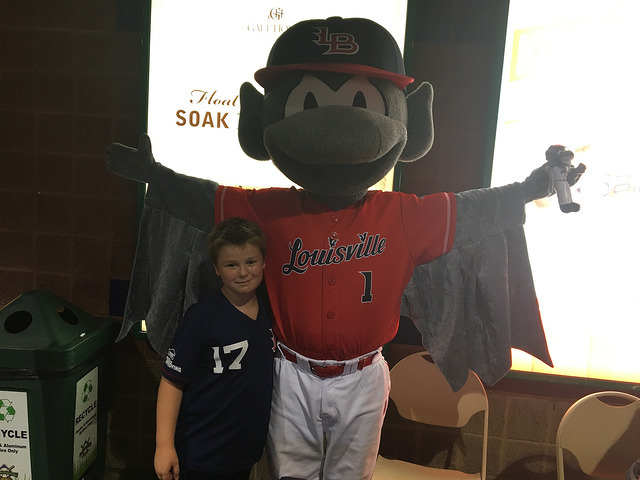 Well, yeah, actually I guess it is… Kade McClure was on the mound for the Cards, and he gave up two runs in the first inning. 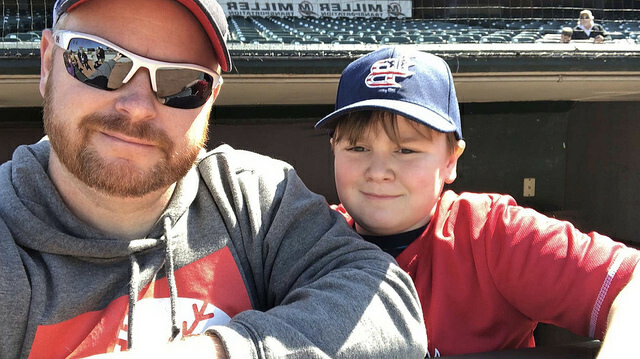 He only lasted 3.24 innings, giving up four runs on six hits. 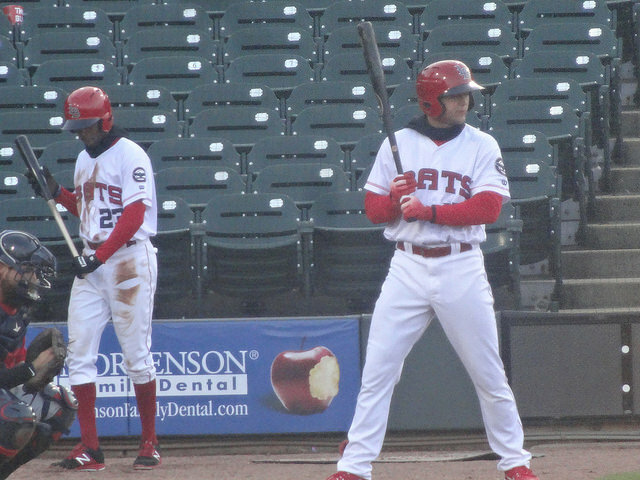 Adam Wolf and Lincoln Henzman each gave up a run, also. 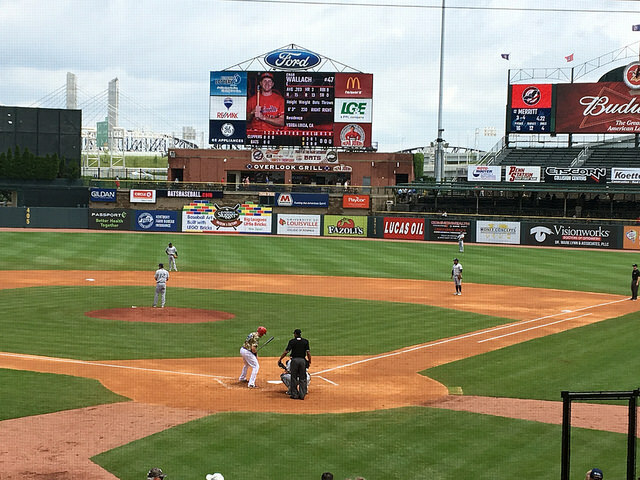 The Cards had little offense, but Brendan McKay did go 2/4 with a home run. FINAL: Cardinals 2, Seminoles 6. 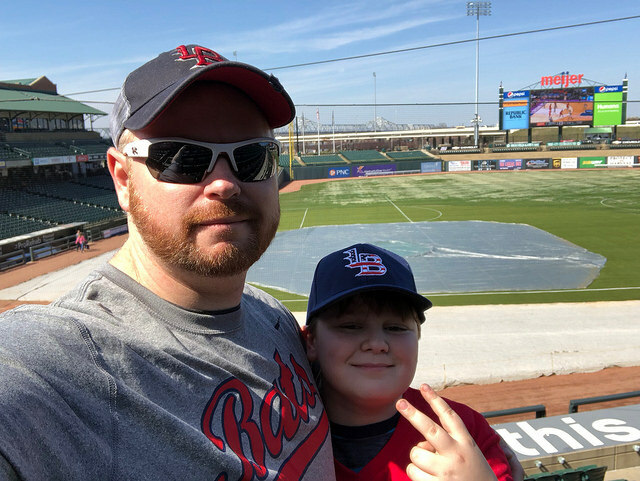 Louisville Slugger Field-Louisville, KY: Well, we finally made it back to Slugger Field for some Bats baseball. 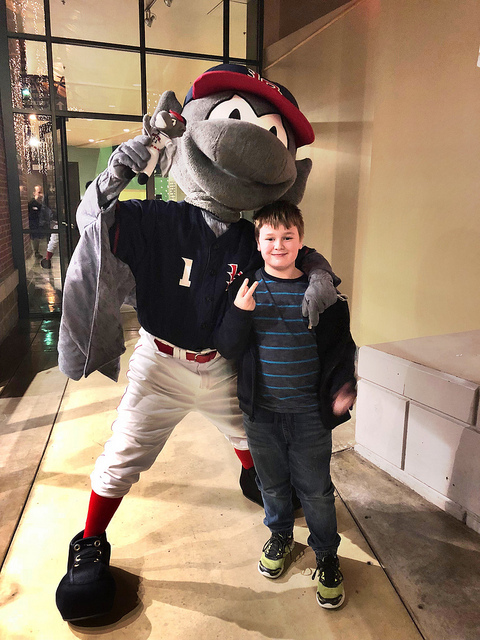 Usually with us the rain is a pain, but last weekend it actually helped, as Saturday nights game was rained out, so we were able to enjoy a double-header on Sunday. 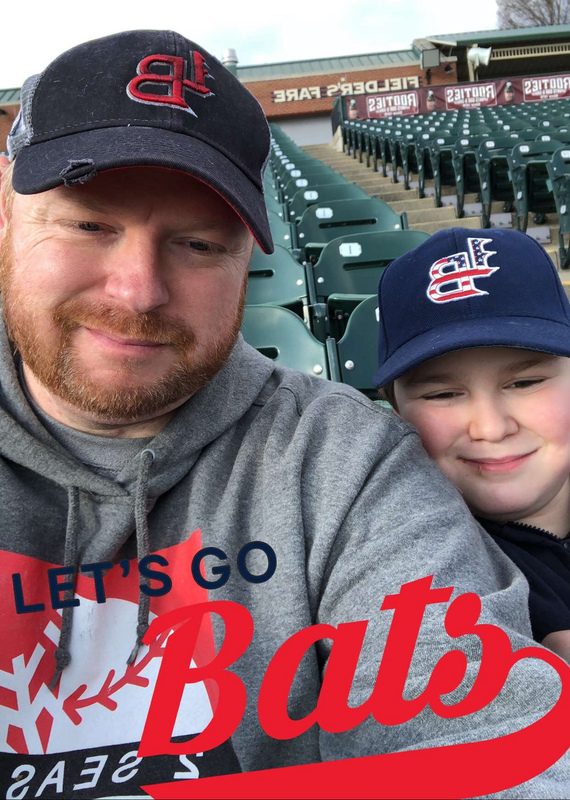 The first game moved by quickly, but we enjoyed it and cheered on our team. 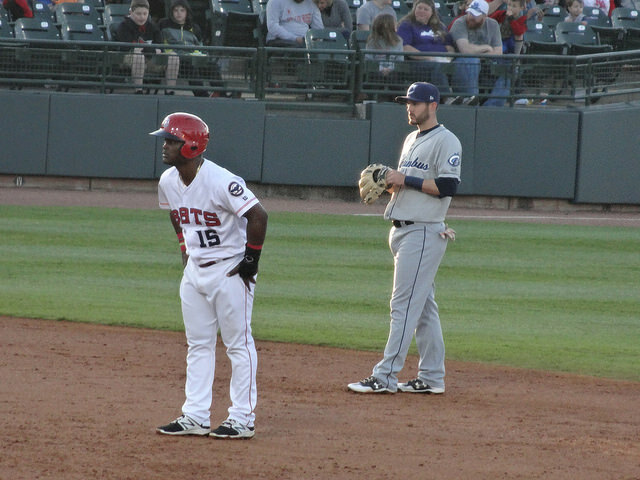 As is with most minor league double-headers, they are a seven inning games, and this one was a pitchers duel. 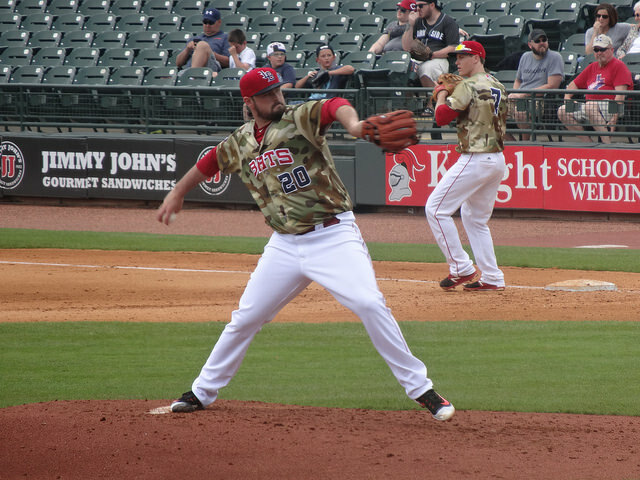 For the Bats, starter Jackson Stephens pitched all seven innings for a complete game shut out. He gave up seven hits, but gave up no walks in his outing. 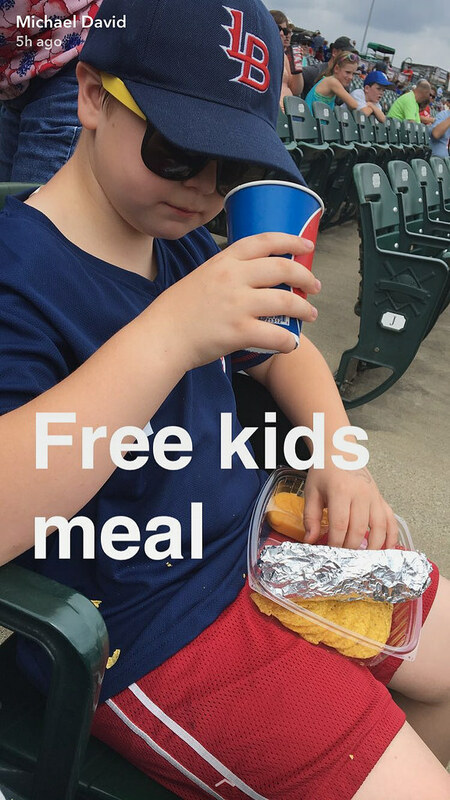 And while we were watching all of the non-offense, Brian was enjoying his free kids meal of a hot dog, nachos, and root beer. 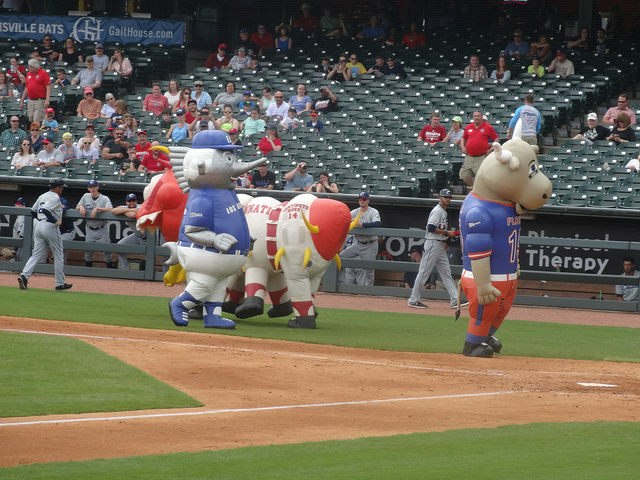 The Zooperstars were also on hand to entertain us. 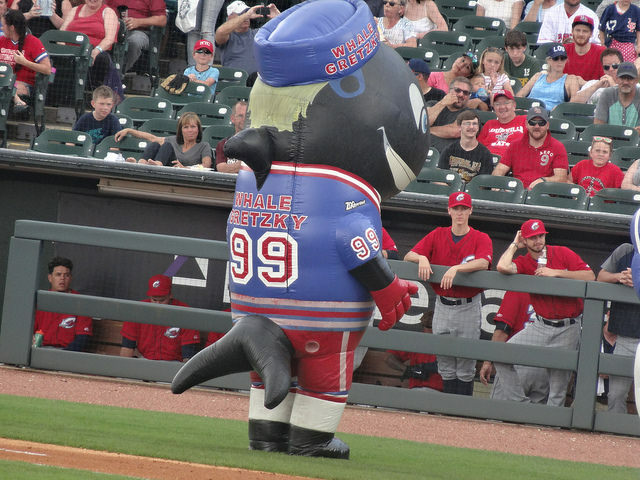 We saw CentiPete Rose, Tommy LaSwordfish, and Tim TeBull during this game. 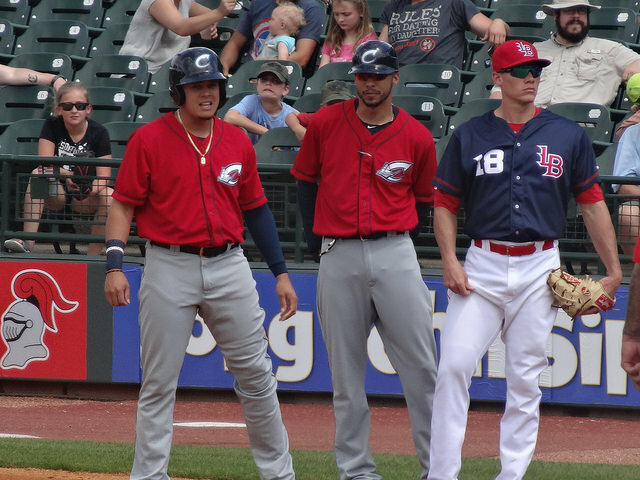 We finally saw some excitement in the final inning. 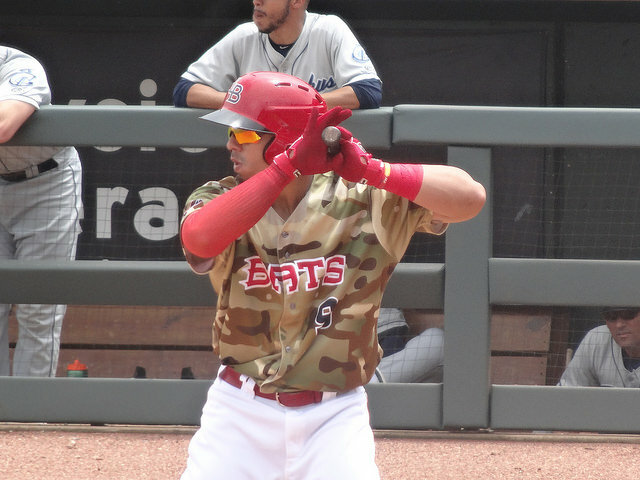 The Bats had back-to-back singles from Sebastian Elizalde and Tony Renda to open the inning. 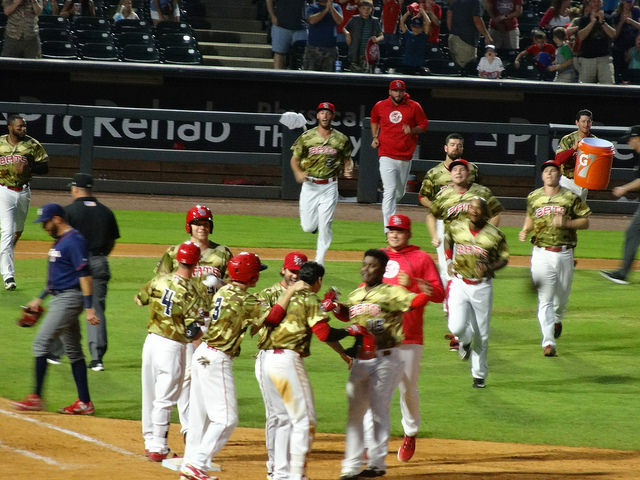 Then Brandon Dixon came to the plate and hit a walk-off single for a 1-0 Louisville victory! 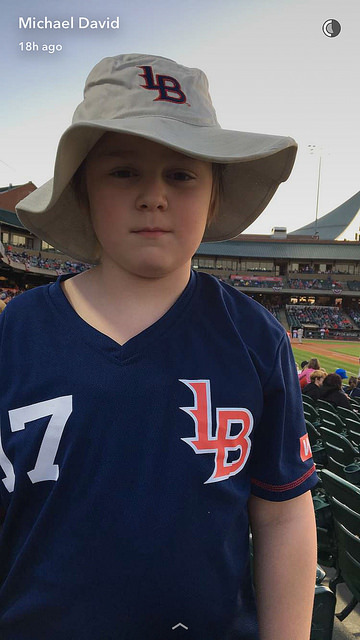 Final (7): Bats 1, Clippers 0. Between games Brian and I went out to the West Wing to get out of the sun for a while. 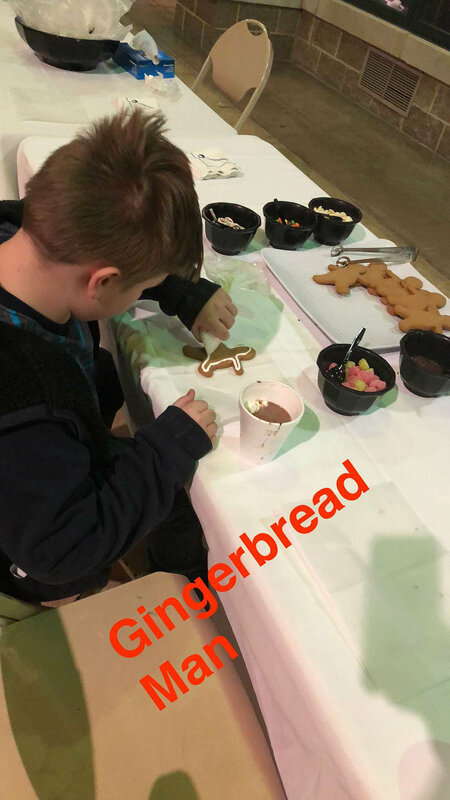 As Sunday is Kids Club day, they had plenty of activities for them. 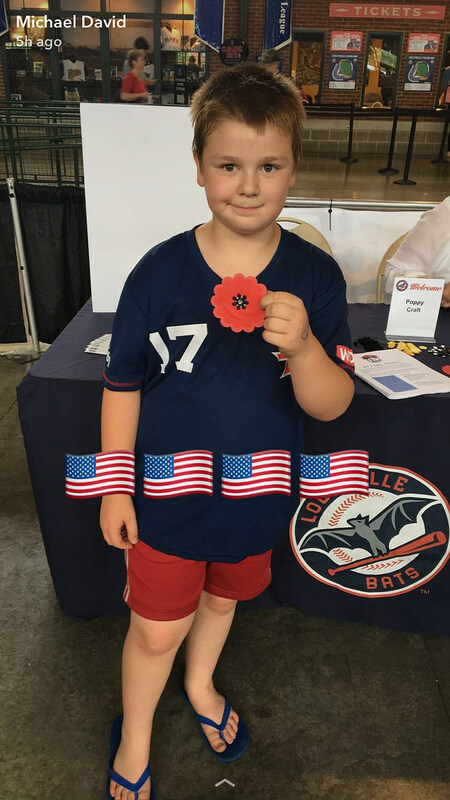 Brian was lucky enough to interact with some of our veterans, and made a poppy flower that will go on a Memorial Day parade float honoring our fallen heroes! 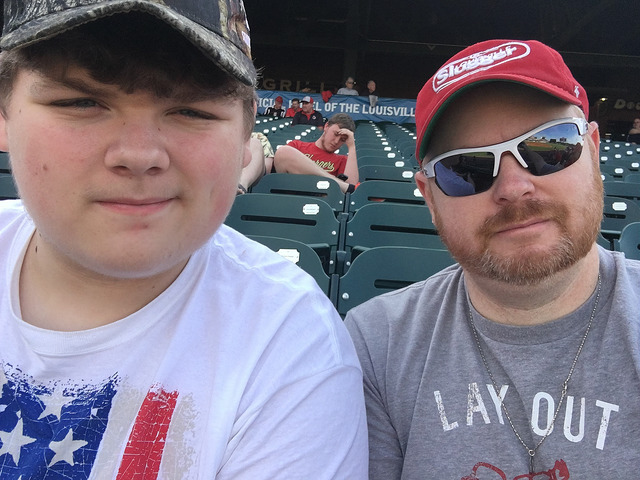 Louisville Slugger Field-Louisville, KY: The 26th marked our one year anniversary of living down here in Kentucky, so we decided to celebrate with a baseball game featuring two Kentucky teams. 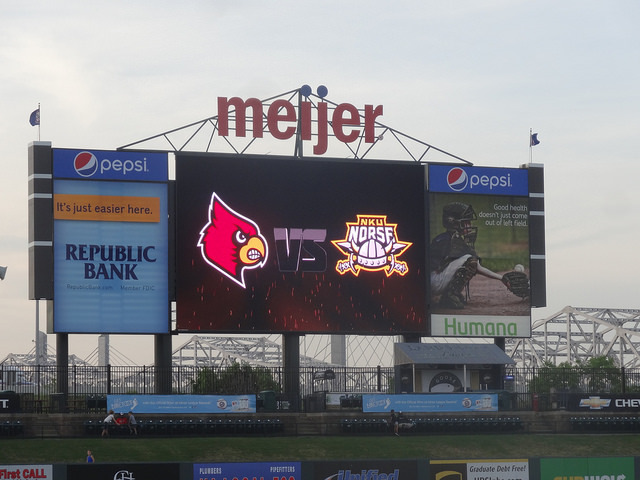 The Cards were hosting the Northern Kentucky Norse at Louisville Slugger Field (where the Bats play) for a special game. This was our first chance to check out NKU, also. 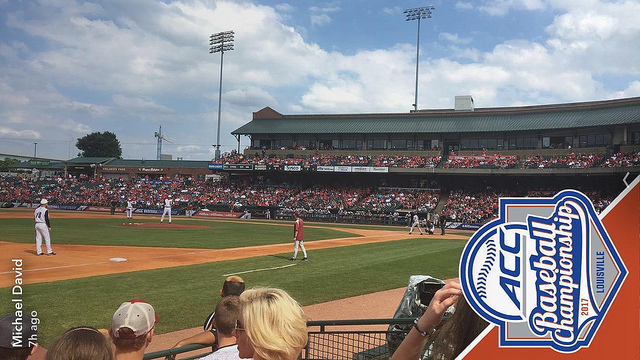 I was fortunate enough to get these tickets for free, after buying tickets for the ACC Baseball championship here next month. Free tickets are the best kind, and Trevor and I had great seats to watch a great game. The Norse actually came out swinging, and took a 4-0 lead! 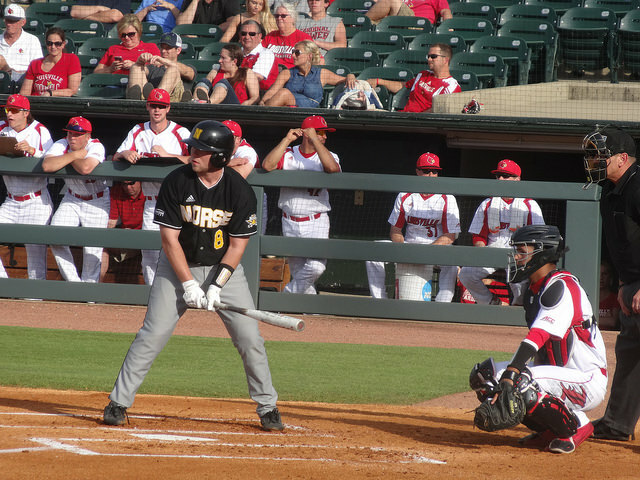 NKU opened the scoring in the first inning on a solo homer run by T.J. Alas. 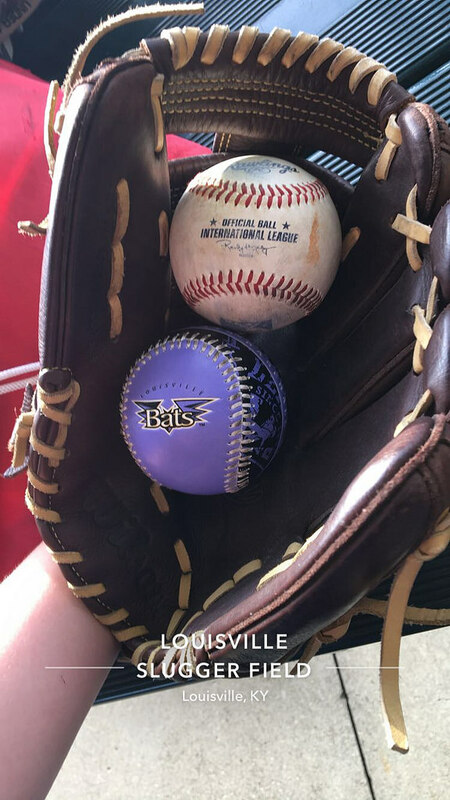 In the second, Chad Roberts scored on a passed ball to put the Norse up 2-0. The Norse poured it on in the third, but Roberts hitting an RBI doubled, and then scoring himself on an RBI single by Mike Moffatt. 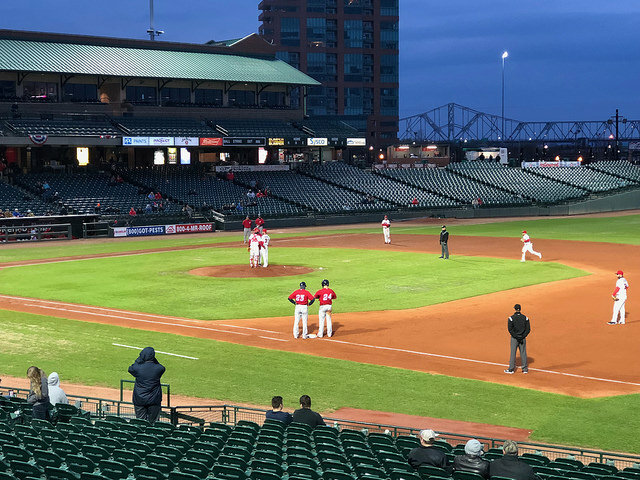 Louisville’s starting pitcher Bryan Hoeing didn’t last past the second inning, but his offense came around to bail him out. 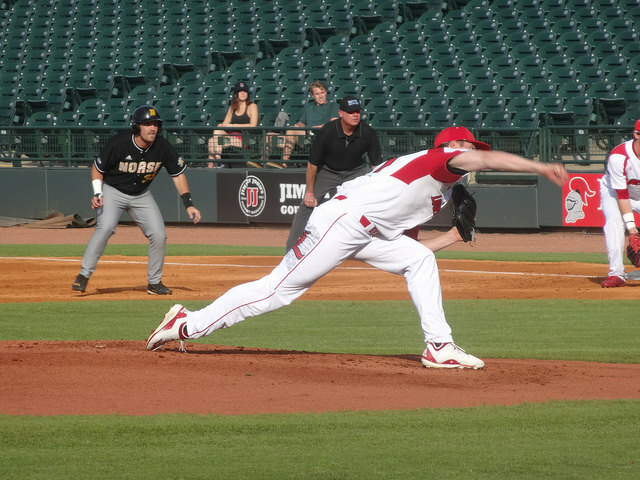 Adam Wolf picked up the win for the Cards, throwing 2.1 scoring innings while striking out three. 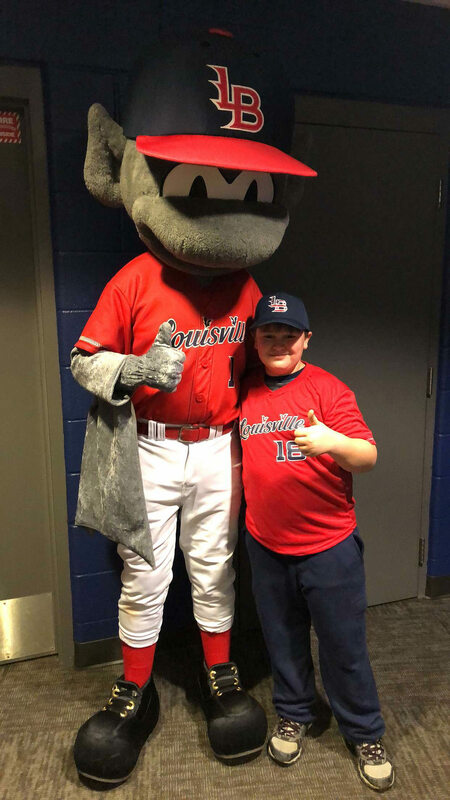 Relief pitcher Sam Bordner also pitched two scoreless innings, while Lincoln Henzman earned the save by pitching a perfect ninth. 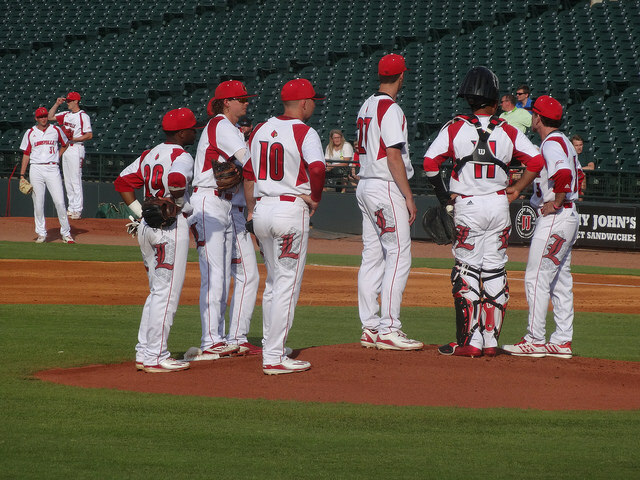 Offensively, Louisville was lead by Drew Ellis and Zeke Pinkham. 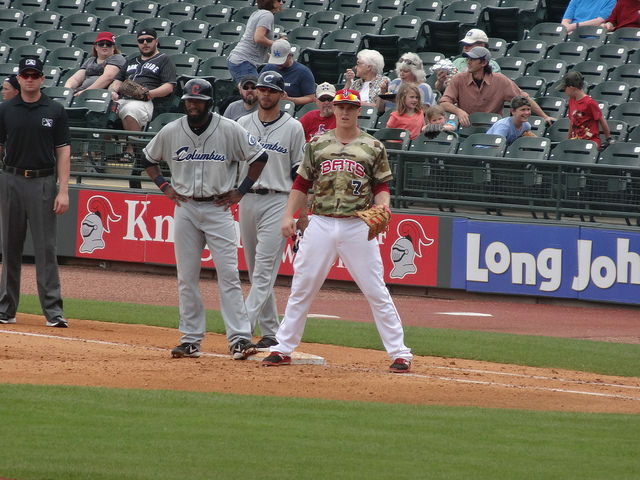 Ellis started the comeback with a solo home run of his own in the fourth inning. 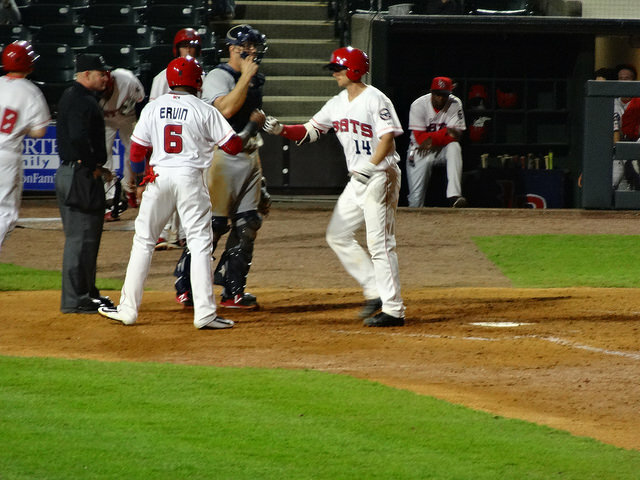 He then followed that up with a two-run moon shot in the fifth to put the Cards up 5-4. 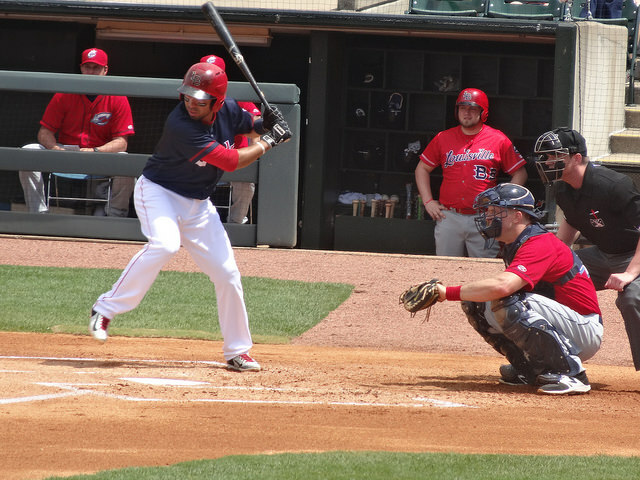 Both players were 2-4 on the day with three RBI, with Pinkham getting his first career home run. Charlie Jerger ended up taking the loss for Northern Kentucky. 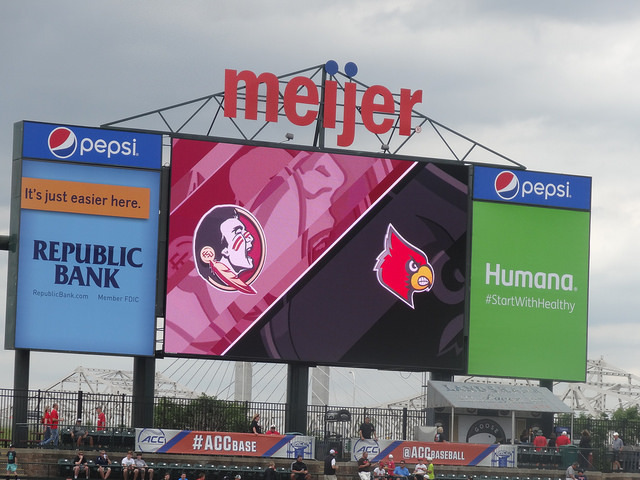 It was a funny game with some controversial calls, with both head coaches making appearances out on the field. Norse head coach Todd Asalon was even ejected with the classic chest bump and dirt kicking. Final: Cardinals 6, Norse 4. 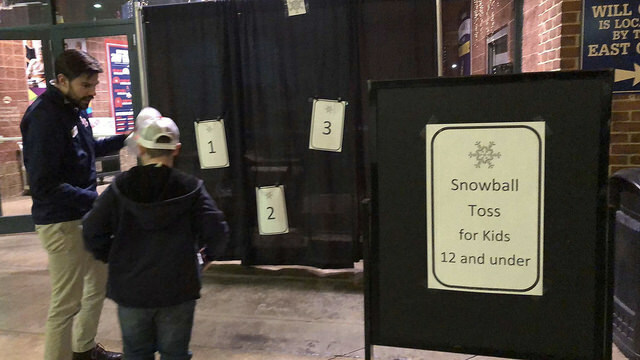 A fun game for Trevor and I. Some of the photos don’t show it, but there was a decent crowd and they were entertaining and good natured themselves. 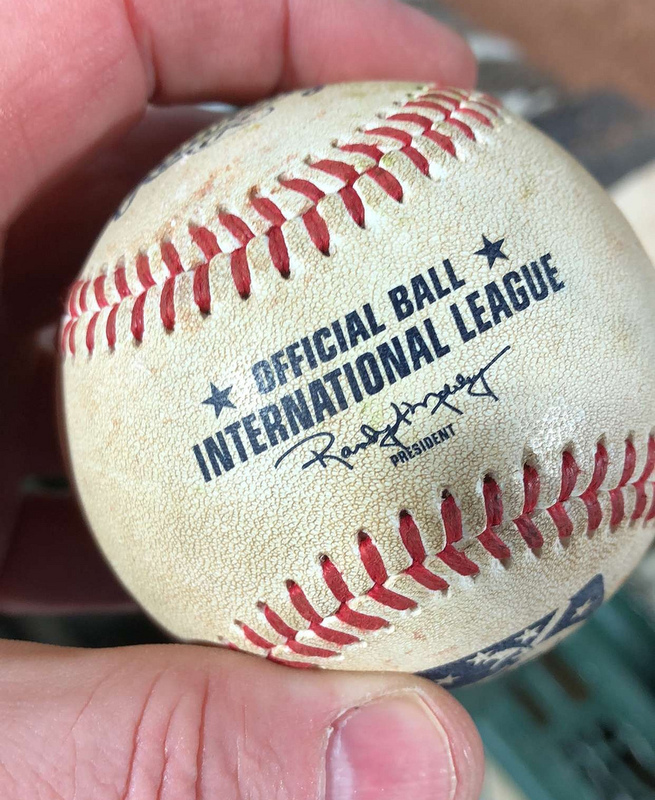 We actually don’t have any ballgames planned out between now and the end of May, but that doesn’t mean we won’t find one to take in. 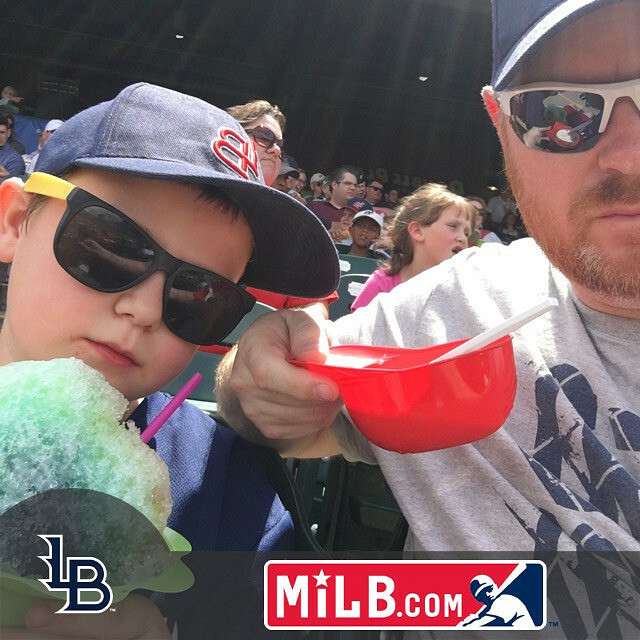 Most likely it will be the Cards or Bats, but the Brian playing on the weekends sometimes it’s hard to find one that fits our schedule. 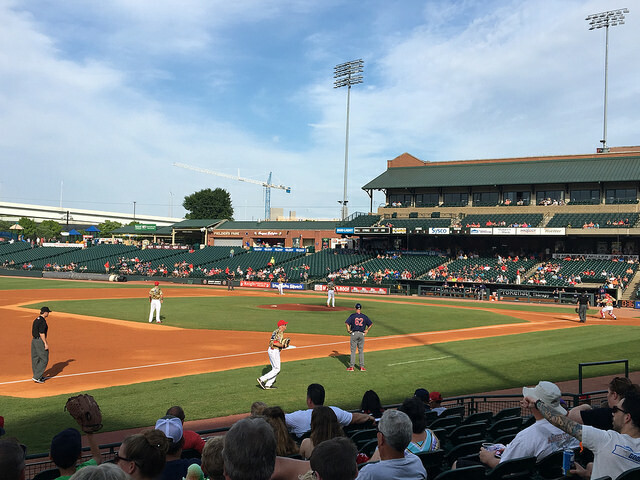 Louisville Slugger Field-Louisville, KY: Another fun night of baseball, this time back in the ‘Ville. This was the last game my dad would be at on this visit. 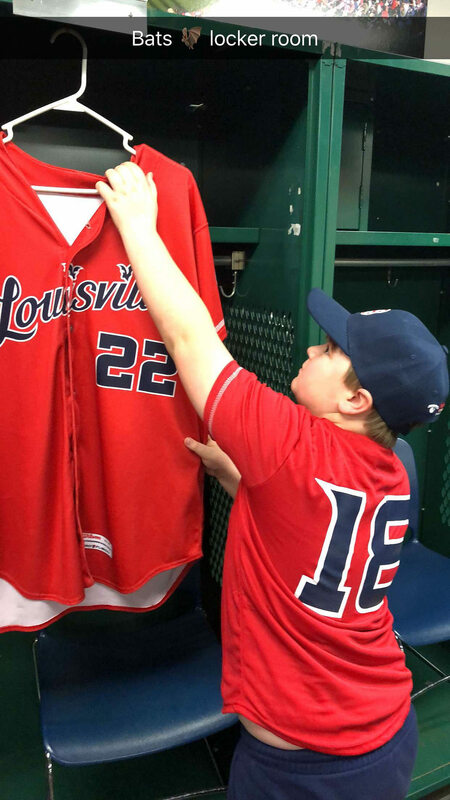 He plans on coming back next month, though, for some more minor league ball and the ACC Championships. It was a beautiful night, as the weather just seemed to get better as the weekend went along. Brian played on the playground most of the game, but was happy to spend some time with his papa, too. 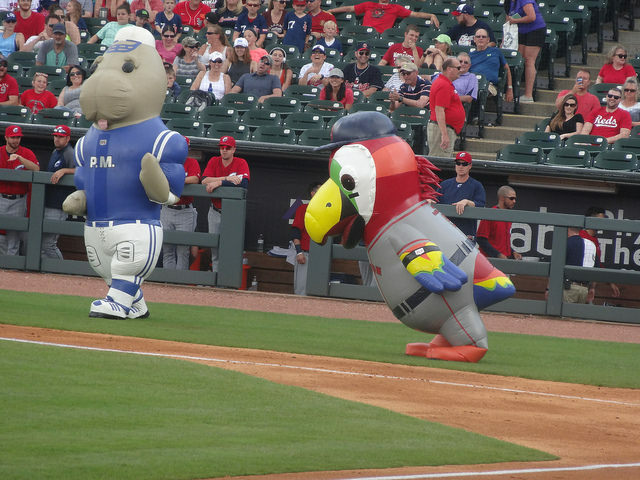 This was a good game, with the Bats down, but certainly not out. 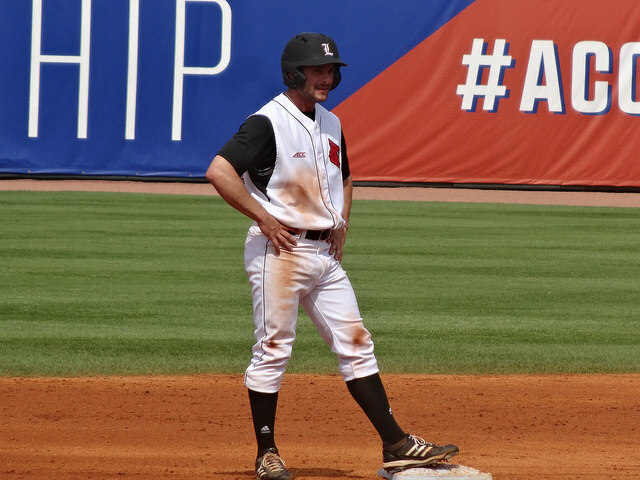 Louisville was lead offensively by catcher Rob Brantly, who went 3-6 with four RBI’s, including a 2-run homer in the seventh and a game tying double in the eighth. 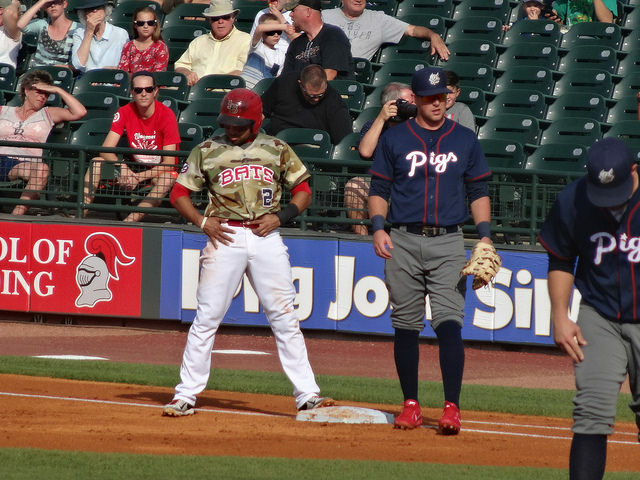 Jesse Winker helped out by going 2-4 with an RBI and run scored, and Philip Ervin went 2-5 with two runs scored. 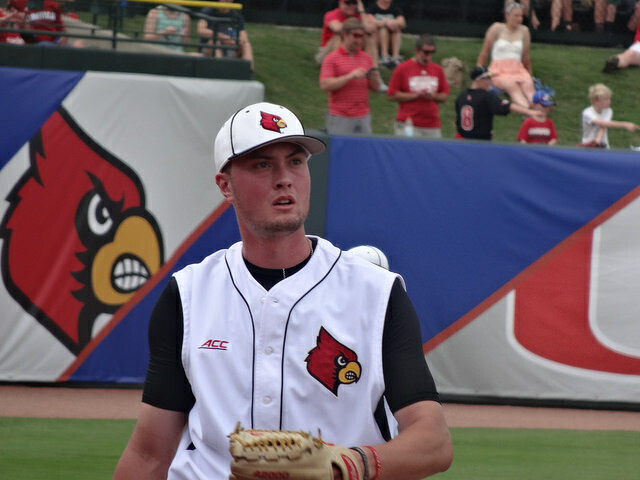 On the mound, Jackson Stephens got the start for Louisville. 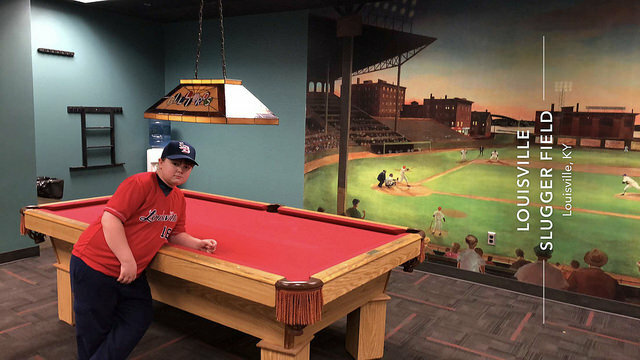 In four innings pitched, he gave up five runs while striking out four. 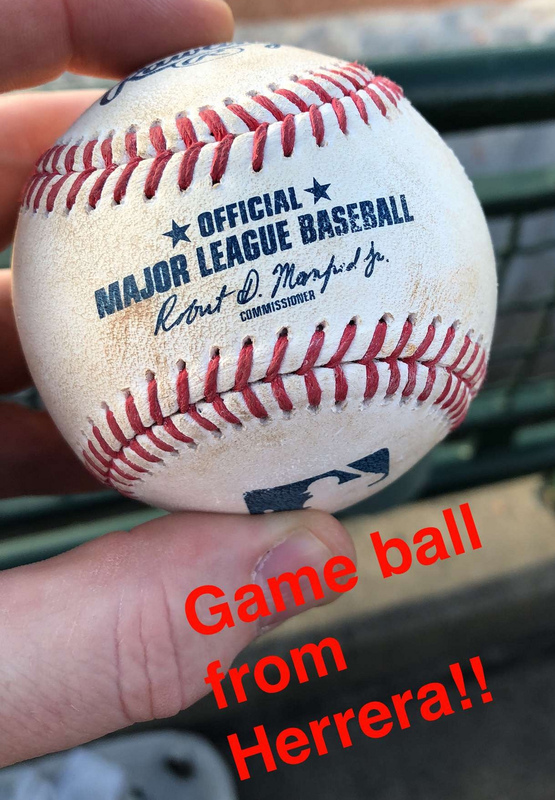 Luckily the offense and bullpen bailed him out, so he didn’t get the decision. 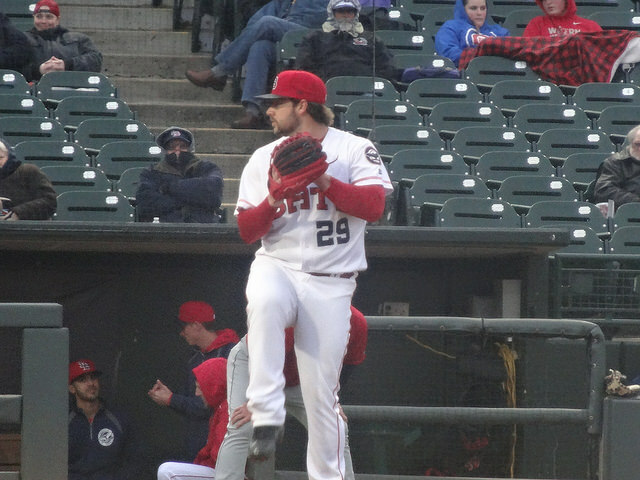 Evan Mitchell ended up taking the loss, though, after giving up the winning run in the 10th. 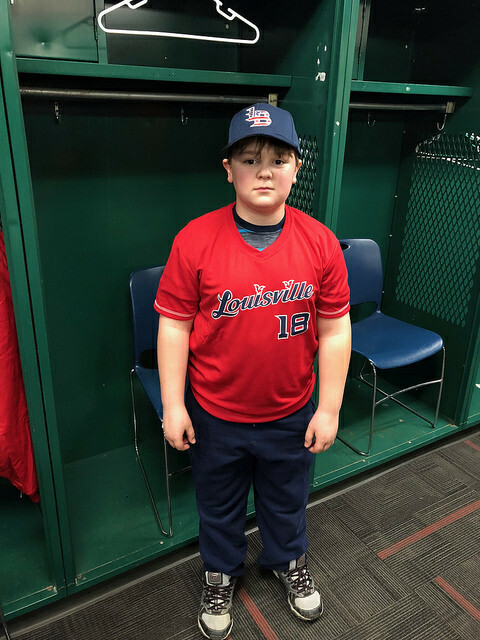 He pitched two innings and gave up three hits. 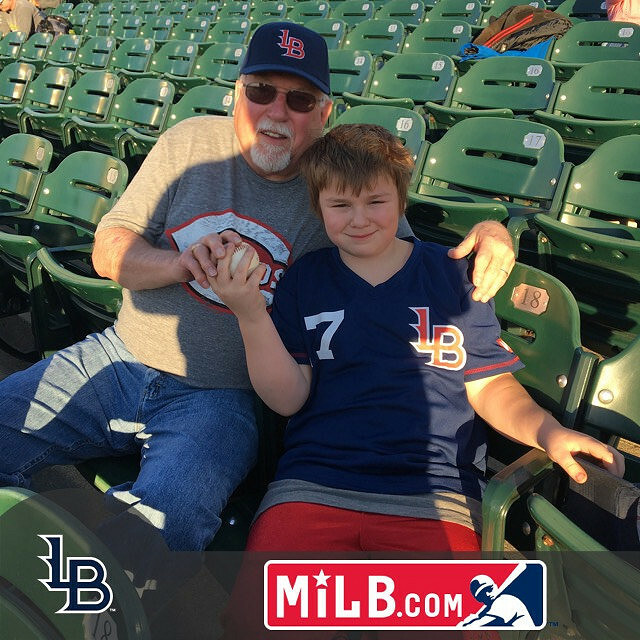 Final in 10: Bats 8, Clippers 9. 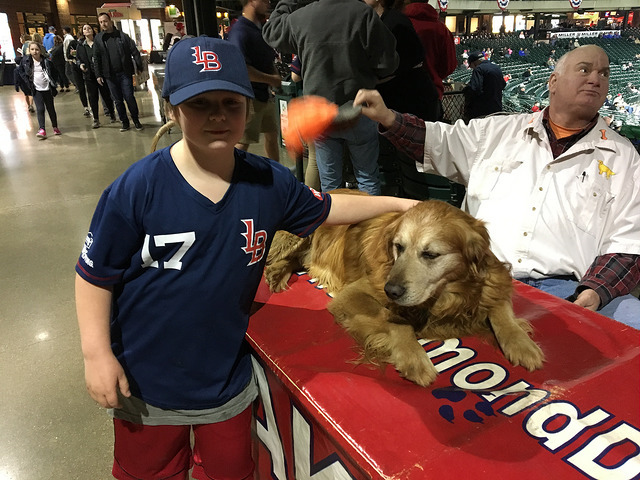 Another fun night, with it being capped off with Brian getting to meet Jake the Diamond Dog. 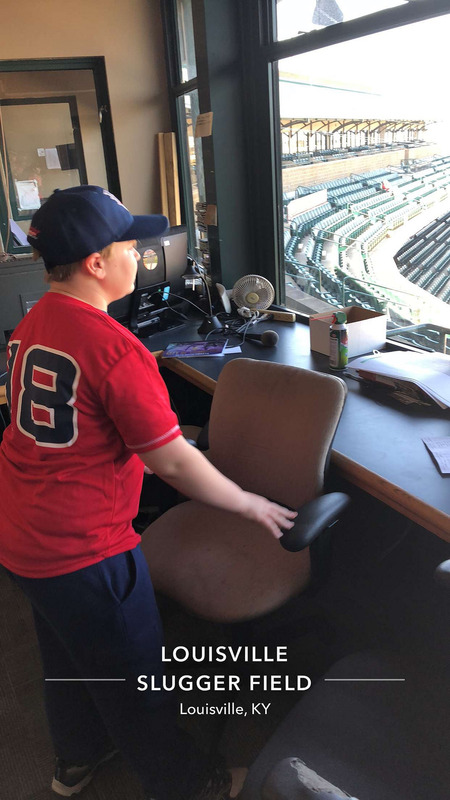 We saw him a couple of times last season, as he acted as bat boy and brought water to the umpires. He was hot and tired by the end of the night, though. 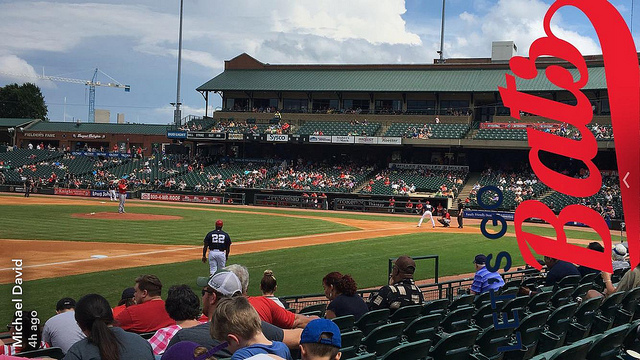 We look forward to our next game, which will probably be right back here at Louisville Slugger Field.